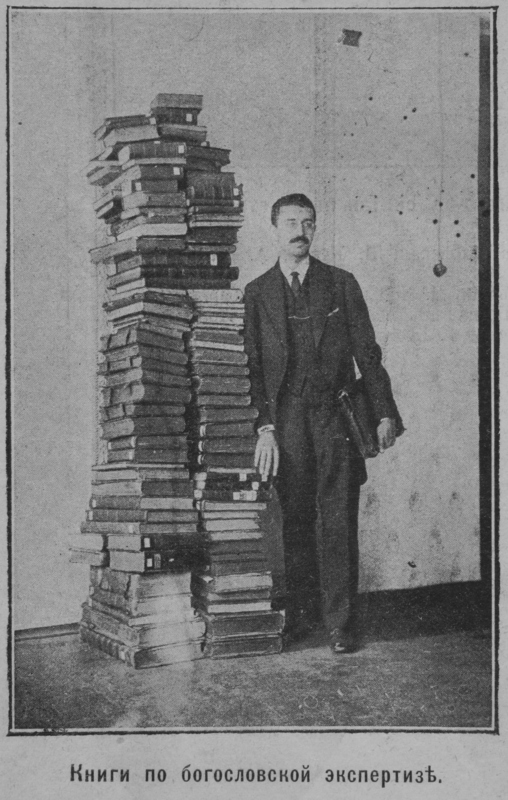 Pile of Jewish religious texts for expert testimony in court. A prosecution expert testified they sanctioned ritual murder. Vera Cheberyak, the Dark Diva of the Beilis Affair. A notorious criminal, and likely mastermind of the boy's murder, she, astonishingly, became a star witness for the prosecution. Zhenya Cheberyak, Vera's son. A key witness, he died suddenly and some said suspiciously. The Defense Team. 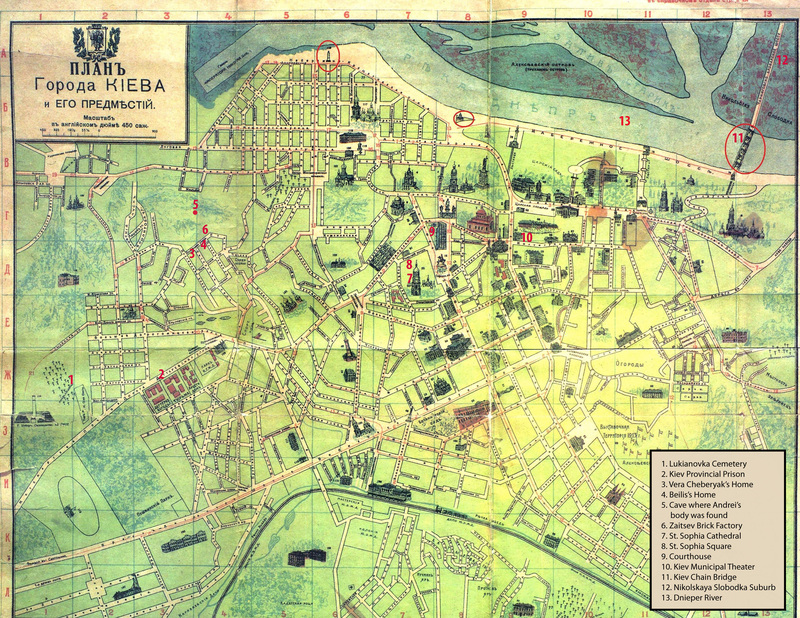 Beilis was defended by some of Russia's foremost attorneys. Court in Session - Mendel Beilis is in the dock at right. The witness stands, facing the judges. The jury. The peasants are recognizable by their bowl haircuts and caftans. A Jewish brick factory clerk is falsely accused of ritually murdering a Christian boy for his blood to make Passover matzo – the age-old blood libel. His trial in 1913 becomes an international cause célèbre. On March 20, 1911, the body of a thirteen-year-old boy named Andrei Yushchinsky was found in a cave on the outskirts of Kiev, then part of the Russian Empire. He had been stabbed some four dozen times. Four months later, Russian police arrested Mendel Beilis, a 37-year-old father of five who worked as a clerk in a brick factory nearby, and charged him not only with boy’s killing but with the Jewish ritual murder of this Christian child. There was no evidence linking Beilis to the murder and he had a solid alibi, but the state had decided to charge a Jew with this horrible crime and Beilis was the most convenient choice. 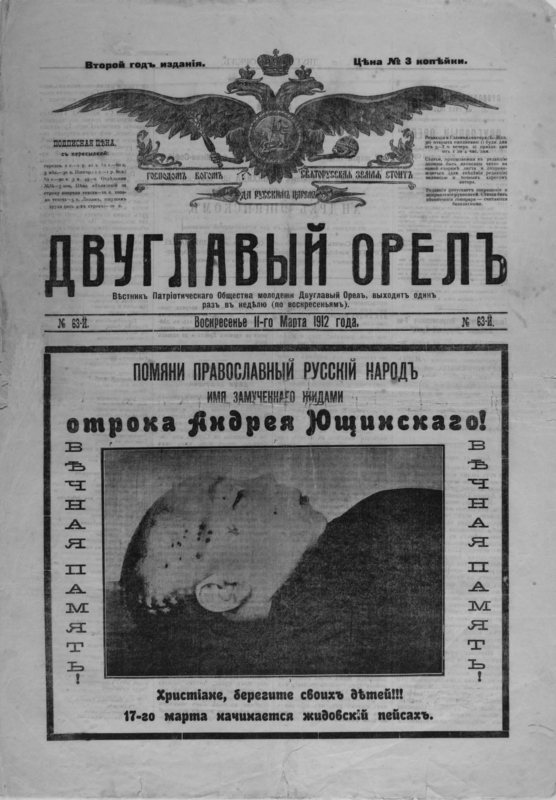 As a handful of Russian officials and journalists searched for the real killer, the rabid anti-Semites known as the Black Hundreds whipped into a frenzy men and women throughout the Russian Empire who fanatically believed that this was only the latest example of centuries of Jewish ritual murders of Christian children. Beilis was imprisoned for more than two years in horrific conditions before his trial in the fall of 1913, which made worldwide headlines. Some of the era’s most esteemed personages rallied to Beilis’s defense, including Thomas Mann, H. G. Wells, Anatole France, Arthur Conan Doyle, the Archbishop of Canterbury, Jane Addams and Booker T. Washington. Pro-Beilis rallies in the U.S. drew thousands but nothing could stop the case from going forward. With the full backing of Tsar Nicholas II’s teetering government, the prosecution called an array of “expert witnesses”—pathologists, clergymen, a psychological profiler—whose laughably incompetent and, in some cases, perjured testimony horrified liberal Russians and Beilis’s supporters in the West. Among the witnesses the prosecution presented to the jury were: a pathologist who was paid a 4,000 ruble bribe; a drunken couple who had been plied with alcohol by an investigator; and a Catholic priest, pseudoscholar, and sometime con man who testified to the reality of the blood ritual. A star witness for the defense was a detective known as “Russia’s Sherlock Holmes” who tried to prove Beilis’s innocence and find the real killers, but was imprisoned by a vengeful state for his efforts. But the most sensational witness was the dark diva of the Beilis affair, Vera Cheberyak. A character worthy of one of the great Russian novelists, she was the leader of a criminal gang, and was very probably the mastermind behind the boy’s murder. Astonishingly, the state drafted her to become a star witness against Mendel Beilis. Beilis’s fate rested in the hands of a largely peasant jury. After thirty-four days the trial came to a dramatic and ambiguous conclusion. The consequences reverberated far beyond the day of the verdict – into the Nazi era and beyond. A hundred years after the trial of Mendel Beilis, the blood libel is still with us. Vera Cheberyak and her gang, Andrei's likely killers. One died in mysterious circumstances. The headline reads, "Who Are the Killers?" 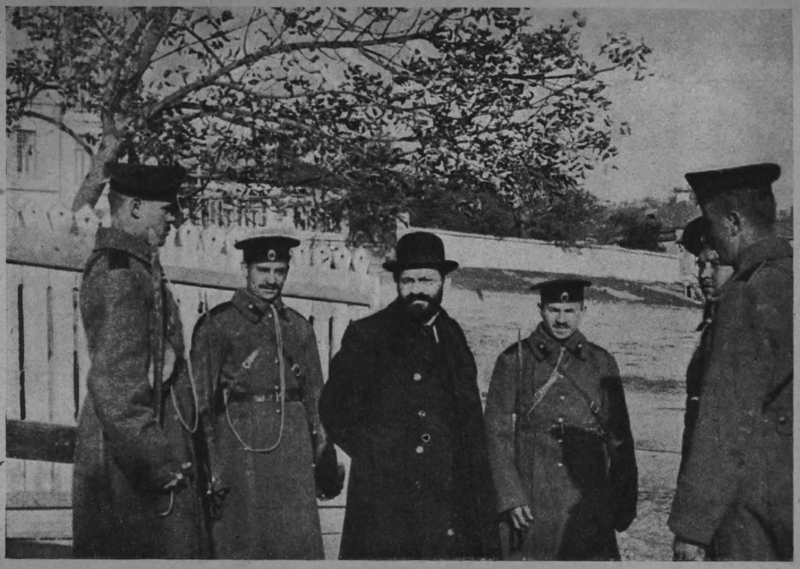 Detective Nikolai Krasovsky, "Russia's Sherlock Holmes," who attempted to exonerate Beilis, and paid dearly for it, flanked by his two assistants. Tsar Nicholas II's role in the case was obscure but possibly crucial. His top ministers organized the frame-up of Beilis. "A page-turning history/​true-crime story ... his easy narrative style makes the book read like a novel." Levin’s book is beautifully written and impressive in its scholarship, especially the use of archival materials that only recently have become available. I have rarely read a book of serious history with greater admiration and fascination. EDMUND LEVIN is a Writers Guild and Emmy award–winning writer/producer for Good Morning America. His writing has appeared in The New York Times, The Washington Post, The Wall Street Journal, The New Republic, The Atlantic, and Slate, among other periodicals, and was included in The Best of Slate: A 10th Anniversary Anthology. He studied Soviet and Russian affairs at Columbia University’s Harriman Institute and has traveled widely in the former Soviet Union.